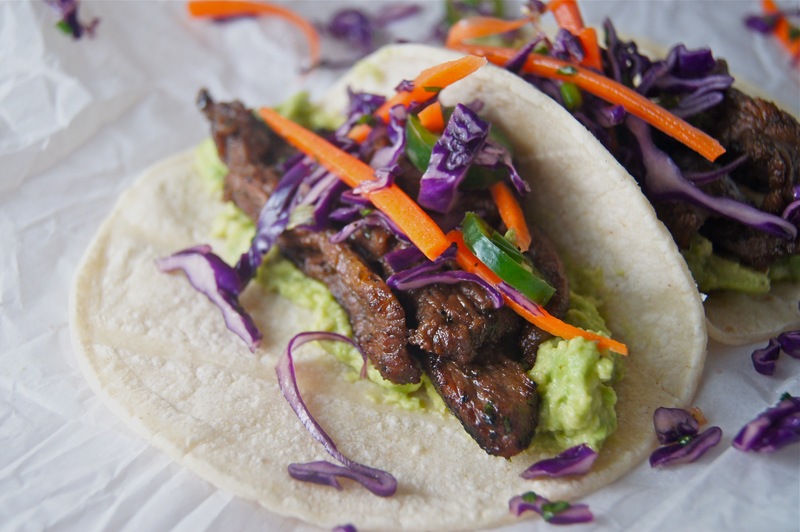 Then, let’s smear on some lime avocado…you know, for the smooth, creaminess factor. And then. Fireworks. Rainbows. Balloons and streamers, friends. This one…it’s quick, simple and the biggest tastebud party known to human kind! You must, y’all, you just MUST make this one!!! Notes: if you are not concerned about gluten, feel free to use soy sauce instead of tamari. Also, any high heat oil such as canola will work instead of grapeseed oil. 1 (1-1 1/2 Pound) Flank Steak, sliced into thin strips. Place flank steak in a plastic bag. In a medium bowl whisk together the cilantro, honey, sesame oil, tamari, grapeseed oil and garlic. Set 3 Tablespoons of the mixture aside and pour the remaining mixture over the flank steak, sealing the bag and tossing to coat. Refrigerate for anywhere from 30 minutes up to 2 hours. Add the cabbage, carrot, jalapeño and green onion to a small bowl. Stir the rice vinegar into the remaining 3 Tablespoons of marinade and drizzle the marinade over the top of the slaw. Toss to coat and set aside. Heat a large cast iron skillet or grill plan over high heat. 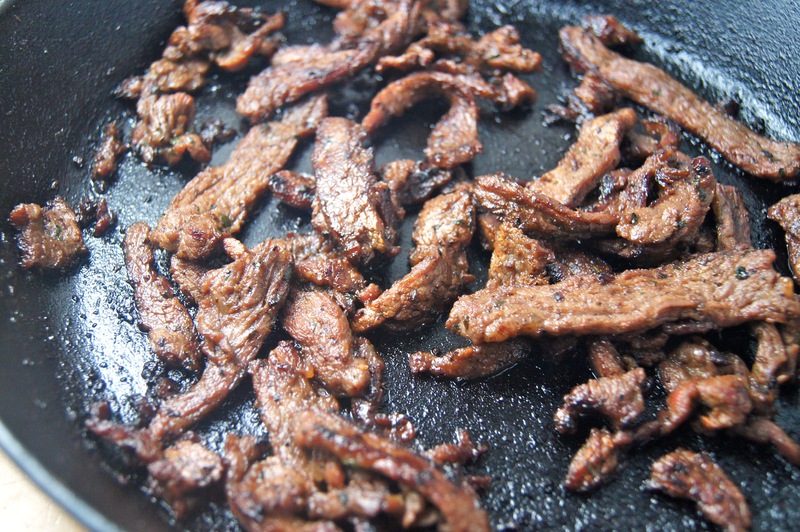 Add the steak in a single layer and cook for 2 minutes without stirring. After two minutes, stir and cook for an additional 2 minutes, stirring occasionally or until steak is no longer pink on the outsides. Stir avocado and lime juice together and season with salt and pepper, to taste. 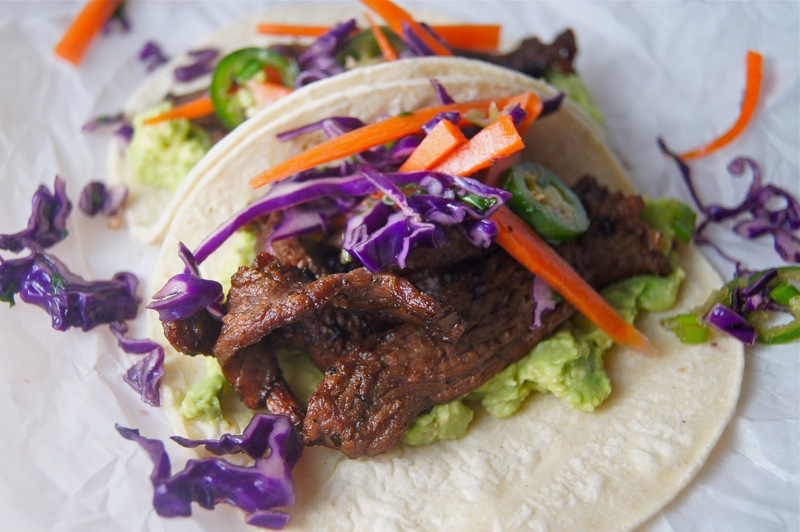 Smear avocado on corn tortillas, top with steak and prepared slaw and squeeze additional lime juice over the top, if desired. Serves 4. This looks great – had it out at restaurants, but never tried it at home. Recipe looks yummy – going to try!! Dang those tacos look incredibly tasty!! Made it tonight. Both boys gave it a “make again “ rating. I’m so glad B! Pretty big compliment coming from foodies like you three!